One of my favorite things about starting Satsuma Street has been meeting so many great people who share my design sense and are also passionate about cross stitch! The crazy thing is, I haven't ACTUALLY met most of them...they're customers whose names I recognize when they order, or Instagram followers who always have a nice comment for me when I put out a new design. Some of these lovely people have been with me almost from the beginning, when I first started Satsuma Street 5 years ago, and even if we haven't met in person, I feel like we're old friends. I recently started the Satsuma Street Stitchers group on Facebook, and it's been another great way to get to know the people who make Satsuma Street such a happy place to work. I LOVE seeing photos of the projects people are working on! It never ceases to amaze and humble me that other people enjoy my designs and spend so much time and care on them. 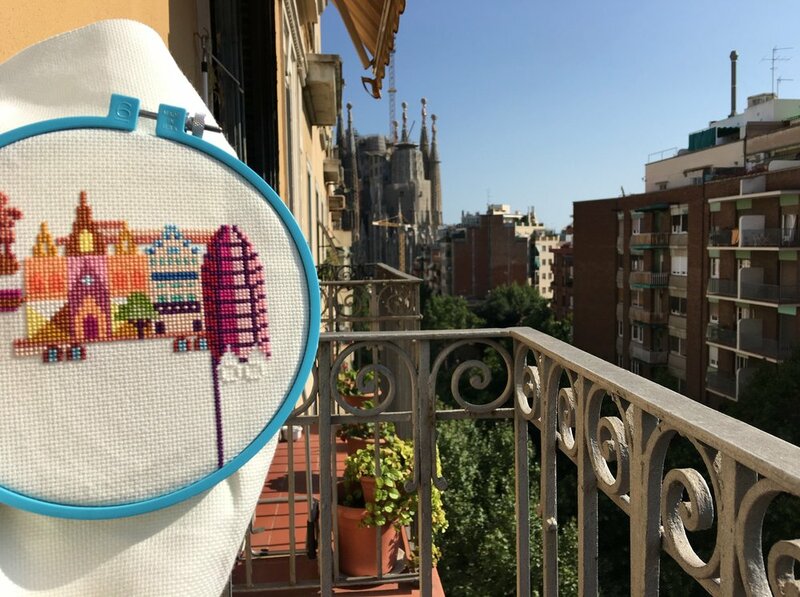 Lucky stitcher Ann Marie Grathwol Adamick got to work on the Pretty Little Barcelona design while actually visiting Barcelona! Like most small business owners, I struggle with finding enough time to manage my social media, but the great thing about the Facebook group is that it's primarily for Satsuma fans to support and get to know each other. So while I'm the moderator, the real life of the page comes from the members. If you're a Satsuma super fan, or if you'd just love to see happy colorful stitching in your Facebook feed instead of depressing news, why not join us? You can find the group here.